“Sumiyakiya is a specialty yakiniku (grilled meat) and horumon (innards) restaurant that was opened 18 years ago and that I took over from the previous owner 8 years ago. In 2012, I met Akmal Abu Hassan, the president of Malaysia Halal Corporation who told me about the struggles Muslim tourists face when they visit Japan in terms of food. Tourists mentioned that they would like to eat Japanese yakiniku. It was then I decided to make an effort to turn the restaurant into a Halal-friendly establishment. To become Halal-friendly, I switched our source of beef to Miyazaki herb beef (where cattle are fed herbs). In order to acquire Halal certification, I also switched the chicken to the ones from Aomori Shamrock in January 2014 instead of those we originally get from Brazil. Of course, this switch meant increased costs. While the meat is of high quality, the Halal slaughter means that the Halal-certified meat is certainly more expensive than conventional meat. Many people misunderstand Halal as a religious diet, but in fact, anyone can enjoy Halal foods. When I took time to learn about Halal food, I came to regard it as something similar to organic food. I would also like to work on an organic menu in the future to enhance quality and better appeal to Japanese customers. At present, 80% of our customers are Muslims. One of our customers, Roger, who has been living in Japan for 26 years, said that “Sumiyakiya is not a Halal restaurant, it is a restaurant that provides Halal dishes”. While we try to cater to Muslim customers as much as possible, it is difficult to make all our facilities and equipment completely Halal-friendly. During my interview with the owner of Sumiyakiya, he didn’t forget to mention that they have non-Halal dishes which use alcohol, such as Bibim guksu (a cold dish made with very thin wheat flour noodles), and his Muslim customers may choose whether to order them. 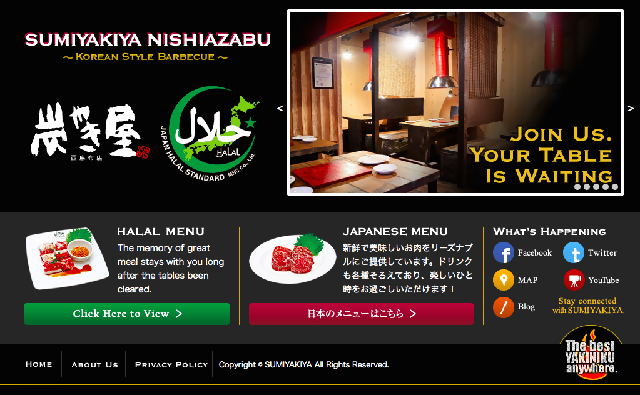 Although Sumiyakiya often serves Muslims for business gatherings or entertainment, the owner also provides strict guidance to Japanese visitors who might not understand Islam. Sumiyakiya takes pride in running the restaurant prioritising respect for Muslims, while striving to maintain the level of Japanese omotenashi. It goes without saying that their dishes taste great.